Primed Metal Barn Stars, Paint Your Own! NOTE: We have switched our primer color from gray to black for quality purposes. With these primed metal barn stars you have the freedom to let your creativity take charge. Paint your own Americana metal stars, patriotic stars, or even simple solid color stars to match your home decor. The possibilities are endless. These primed barn stars are covered with an industrial strength gray primer and ready for you to paint or decorate upon arrival for your metal stars decor. Use these primed non-rusting galvanized Amish metal stars to create a really unique design in your home decor. You can use stencils, decals, your walls for metal wall stars, create your own barn star art, and paint them the color of your choice. Let your barn star art imagination run wild! 10" Primed Ready To Paint Barn Stars! Want to paint your own stars? These 10" primed metal stars are ready to be turned into something wonderful. Add your own latex or oil base paint to create the special touch your looking for. 16" Primed Ready To Paint Barn Stars! These 16" primed barn stars are an exciting way to let your artistic ability shine through. They are made from 22 gauge galvanized material and guaranteed not to rust! 24" Primed Ready To Paint Barn Stars! 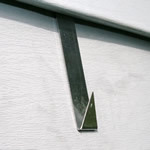 A hang tab on the back of the star is standard for hanging. 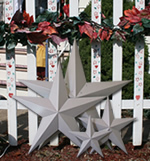 These 24" primed metal barn stars are well designed and already prepped for your creative touch to be added. 32" Primed Ready To Paint Barn Stars! These 32" primed barn stars will allow you to update your indoor and outdoor decor with unlimited possibilities. Take some home today and let your creativity run wild! 40" Primed Ready To Paint Barn Stars! These 40" primed metal barn stars will inspire greatness from you and an artful design to brighten up you and your home. They are the perfect size for for the peaks by the roof line in most homes. 53" Primed Ready To Paint Barn Stars! These 53" large primed metal barn stars will have the power to energize your home once you add the paint color of your choice. These 22 gauge galvanized no rust primed barn stars are sturdy and durable. 72" Primed Ready To Paint Barn Stars! This is a BIG STAR and now you can paint it anyway you like. These 72" primed large barn stars will allow you to add the finishing touch to your home decor and make a BIG statement! These long stars are unique and hard to find. Now you can paint your own long barn stars the perfect shade you want. These 5 point long metal stars are unique, popular, hard to find and they are here! Stars represent freedom and with these primed metal barn stars you have the freedom to let your creativity take charge.